A video of ornamental goldfish swimming through feathery weed plays on the screen of a large box TV near the entrance to Edmund Clark’s exhibition, ‘In Place of Hate’. It reminds me of time spent watching goldfish in an aquarium when accompanying an elderly relative on medical appointments. In those hospital waiting rooms, life was on hold, control was relinquished and the outside world seemed remote. In another institution removed from the wider world, since 2014 Edmund Clark has worked as artist in residence at HMP Grendon, the only entirely therapeutic prison in Europe. I am guilty of preconceptions about the sort of work an artist might make in a prison, anticipating large-scale portraits, clichéd sound effects (clanging doors, rattling keys), images of featureless corridors and the hallmarks of institutionalised living. Some of these are present in Clark’s work, but there’s no sound of keys rattling and the portraits are obscure and unidentifiable. The unexpected nature of the first exhibit further dismantles my preconceived ideas. White-walled, waist-high light boxes mark out a square in the centre of the room. Lit from within, the glass topped boxes contain hundreds of pressed flowers, leaves and grasses collected from the prison grounds. The specimens are carefully displayed, preserved in a state of stasis, intimate details exposed by the light beneath. A gap in one of the light-box walls permits entry to an inner square. The work is called simply 1.98m2 – the dimensions of that inner space and the same as a Grendon cell. The connotations attached to the flowers – of romance, remembrance, mourning – contrast starkly with the implication of incarceration and the dark histories of prisoners. In a second piece, Vanishing Point (all works 2017), my premonitions of concrete and corridors are confirmed. 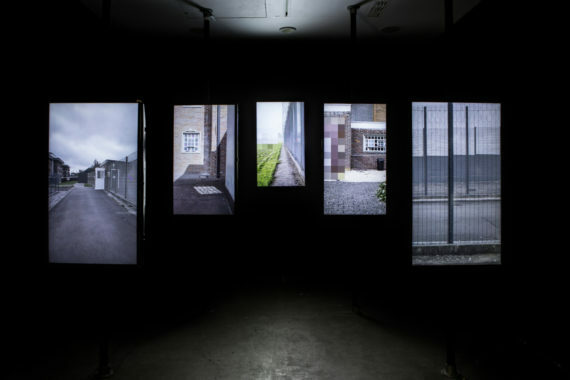 The format of this video installation, however, with five portrait screens arranged in a diminishing ‘v’ shape, extends the perspective and facilitates a new experience of the prison environment. Empty narrow spaces seem to rush towards me as the camera follows long lines of corridors, walkways and fences towards blank-faced walls. Some areas are redacted by flickering pixels, intensifying a feeling of claustrophobia and isolation. Until now I wasn’t aware that a facility like HMP Grendon existed. Inmates of other prisons apply to be transferred there and are required to commit to a continuous process of therapy which aims to make them confront the effects of their behaviour and take responsibility for their criminality. The therapeutic environment becomes apparent in Clark’s two remaining installations, both of which include the physical presence of staff and prisoners, their features either masked or blurred. For Oresteia, a dozen or so chairs are set in a circle as if for group therapy. Three of the chairs feature TV monitors on which the masked characters act out scenes from the Greek tragedy Oresteia. Through this so-called psychodrama, they explore themes of violence, revenge and justice. In My Shadow’s Reflection, blurry-faced portraits of prisoners are projected onto their bed sheets along with images of the pressed flowers and prison buildings. The portraits, produced using long exposures with pinhole cameras, are distorted and indistinct, reflecting the perplexing ambiguity of prisoners trying to come to terms with crimes which may have been monstrous. The work is thought provoking and emotionally disorienting. 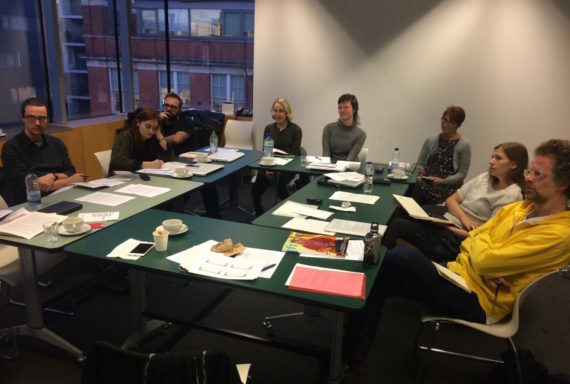 The fact that it has also seen the artist nominated for an award celebrating outstanding work with offenders suggests that the true impact of the residency reaches far beyond the gallery walls.